The most important ingredients for brilliant fall color are sunny days and cool nights. “That tends to create more red pigment in the leaves,” Goerndt explained. “When we have more warm nights and cloudy, foggy, rainy days…that tends to dampen the fall color.” The northeast corner of Iowa is considered the hot spot for fall foliage viewing because of the variety of trees in the area. Hard maple trees, which produce brilliant oranges and reds, are only found naturally in northern Iowa. “The oaks are probably the second most brilliant. We have oaks everywhere in Iowa and they’ll create anywhere from a red to an orange color,” Goerndt said. Hickory and elm trees tend to produce yellow colored leaves. 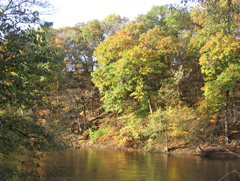 The Iowa DNR operates a “fall color report” on their website and through a telephone hotline: 515-233-4110.